Retaining walls are used as much more than a functioning part of the site. When used appropriately they not only affect the grade of an area but the aesthetic appeal of a project as well. Different materials that Landscape Specialists utilizes include out-cropping stone, manufactured block, and fieldstone. 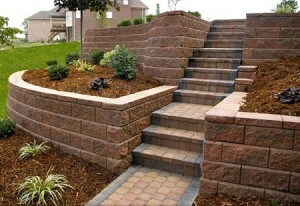 Sitting walls are also great additions to your outdoor space. 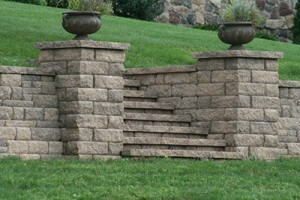 These block walls add a beautiful and functional aspect to the hardscape of a project. Landscape Specialists also offers installation of Unilock® outdoor fireplaces, as well as a variety of fire pit options.